» The Top 3 Best Baby Hiking Backpacks – Nobody Puts Baby in the Backpack? A common struggle for active parents is figuring out how to continue with their individual passions while having children in tow. Outdoor activities like hiking and camping make the use of traditional strollers, even off-road types, virtually impossible to use. Rather than leaving your baby or toddler at home, you can safely take them along with the use of a child carrier style backpack. Bottom Line Up Front? Check out the top 3 at a glance, if you are in a hurry. Baby hiking backpacks are quickly gaining popularity and many popular outdoor gear brands are creating their own models. These backpacks primarily function as a carrier for children under the age of 3, but many have quite a bit of storage available too. There are many advantages of using a backpack. First off, many are extremely comfortable for the baby and the parent. Many parents find that a moderate hiking pace combined with the soft fleece and hug of a good backpack sends the baby to sleep pretty quickly. Some packs allow you to attach toys via loops so the baby can entertain itself while you walk without you needing to stop constantly to pick up dropped objects. Some hikes may completely eliminate the ability to use a stroller but as a parent you will find that even flat, groomed trails make pushing a stroller harder. A backpack puts the weight of your baby on your back in such a way that allows you to most efficiently carry weight. An additional benefit of having your baby close to you in this way is that it gives you opportunity to bond and keeps your child warmer in cool weather. Even the casual hiking parent will find that a baby backpack can be a real lifesaver. If you are an active individual with a new baby or a child under the age of 3, consider these 3 amazing backpacks that will let you take your little one along for the next adventure. This is where you need to know the key criteria. Not all carriers are interchangeable. In fact, most aren’t. Weight Maximums: Once your little one is above 25 lbs. you will need to upgrade to a child carrier (30 lbs. is the max). Remember, that’s TOTAL weight (including all the other gear you put in in addition to the baby. Weight Minimums: Typically, infant carriers are suitable for babies from about 6 months onwards. Or, 16 lbs. minimum. Depending on the type of hiking or outdoor activities, certain features might take on enhanced importance. Frames: External frames are the norm for baby carriers, although you will find some internal frames as well. Carriers without frames are really only suitable for for up to 30 lbs. of combined weight. Suspension: A good internal suspension system can be the difference between back pain and an enjoyable experience. Most good packs feature adjustable straps based. Stand Stabalizer: This might not be the first feature you think of, but when loading/unloading precious cargo, this is important. Quality packs will have either a fixed or spring loaded kickstand. Cargo Space and “Extras”: Ideally, your baby carrier will also have some convenient compartments and accessories. Things like sun hoods, changing pads, bug netting, and storage poaches can really help maximize space. Just keep the “weight limits” in mind, before you start piling on too much gear. There are many, many backpacks on the market but these 3 really stand out from the competition. We selected these based on our criteria above. Osprey has long been a respected brand for all things pertaining to outdoor gear, but are especially popular for their backpacks. It’s no surprise that their child carriers are some of the best available. Osprey’s Poco series has been tested time and time again with excellent results. Though there are 3 packs within the series, one of the best is the Poco Plus. The Poco Plus is available in 3 different colors and quite attractive in appearance. At a total of 6lbs 15oz, this carrier is lightweight and very compact (approx. 27”x13”x12”). This pack does have a frame which is super lightweight, powder-coated aluminum that is extremely strong and durable. Additionally, all hinges are injected molded and the kickstand has an audible click so you know for sure that is it extended properly. This pack has one of the best carrying capacities of its kind- 48.5lbs. As with most any other backpack, the minimum weight of the child must be 16lbs. For additional safety only use these carriers for babies 6 months and older to ensure they can support their own head unassisted. You really can’t go wrong with the Poco Plus. One downside is that this pack is fairly narrow and can cause a problem for larger babies and toddlers, even if they are under the weight maximum. Due to the mesh ventilation throughout this pack, the Poco Plus does require a period of breaking in to make it as supple and comfortable as possible. Check out this listing for free shipping and the latest deals. Phil & Teds is a fun brand that has constantly been innovating for 18 years now. Their motto of “adapt & survive” describes the company’s goal of providing gear to mothers and fathers that allow them to continue on with the lives as new parents. One top rated baby backpack is the Escape. The Escape is available in two colors and is very compact- folding down to roughly 30”x13”x6”. The backpack weighs 6.6lbs and has a maximum load weight of just about 40lbs. Phil & Teds recommends for safety reasons that the minimum age for child safety is 6 months of age. You can however use this pack upwards of 3 years as long as the kid is under the maximum weight. The Phil & Teds Escape is an incredible backpack that is perfect for any family. Despite the number of accessories and storage options, this pack remains lightweight and super easy to use. If you want something you can throw right on and get out on the trail, this would be an excellent choice. 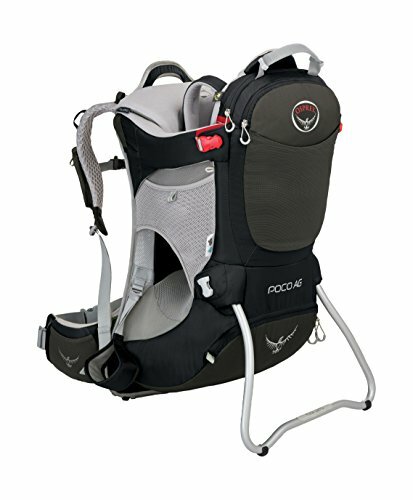 As an added bonus, as your child gets too old for the carrier they can then use the small detachable pack as their own backpack for hikes. Be sure to check out this listing for the latest pricing. Kelty is a well-respected brand that primarily caters to backpackers and campers but were one of the first to sell baby backpacks for hikers. They have a few models of child carriers available with one particular model really standing out from the competition. The Kelty Pathfinder 3.0 is a vibrant royal blue color that is JPMA certified. It is suitable for children from 16lbs to 40lbs and the pack has an overall total weight capacity of 50lbs including gear. For safety reasons this pack is only suitable for children who are old enough to support their heads. The material is 420D Polyester which provides plenty of comfort and stability. Safety is a primary concern of Kelty so this carrier has 3 safety features: an auto-deploy kickstand, non-pinching hinges and a 5-point adjustable harness for the child. For future comfort the Pathfinder 3.0 comes complete with a sun hood to ensure your baby is shaded while on the trail. In addition to being able to carry a decent weight range, the padded seat of this pack is adjustable so most many baby or toddler will be able to sit in it safely. The Pathfinder is ideal for parents of all sizes as it is easy and quick to adjust. This backpack is incredibly comfortable with roughly 1,300 cubic inches for storage. Kelty’s Pathfinder 3.0 is an ideal choice for parents who have smaller children and hike often as its durability is tough to beat. It is a wonderful introductory backpack for any family. You can find the Kelty Pathfinder at this product listing. 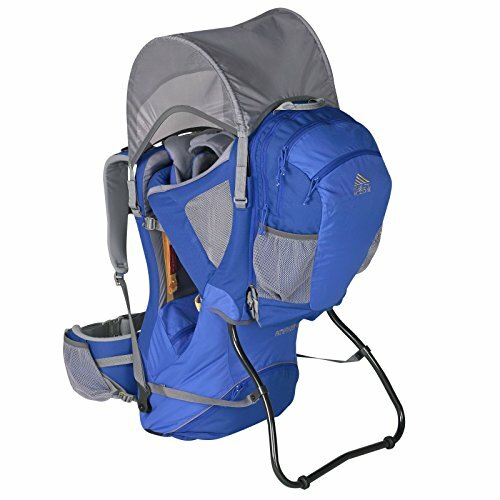 Any one of these 3 packs are wonderful choices for the new parent hiker. Just because you have a child or children doesn’t mean you have to give up outdoor sports such as hiking, camping and other outdoor activities. 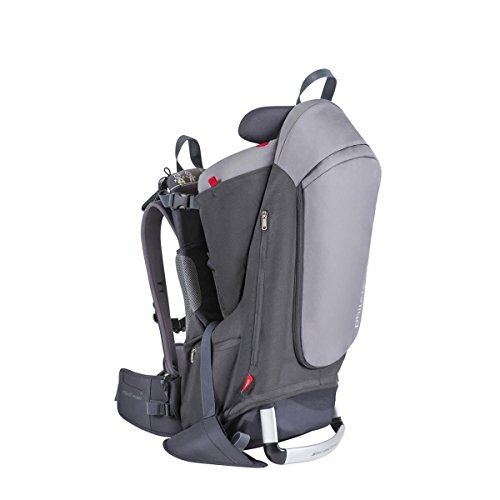 By choosing a safe, reputable backpack you will be able to rest assured that your baby will be snug and comfy while you walk. It is always a good idea to try on different backpacks if possible. Even better if you can try it on with your child to ensure both of you are comfortable with it.